Never use alcohol, cleaners with vinegar, ammonia, bleach, or window cleaners to wipe off your glasses as these substances may damage the coating on your glasses. Instead, use lukewarm water or lotion-free dishwashing liquid in a tiny amount. You could follow instructions found on sites like firmoo.com. ● Using dirty hands when cleaning. If you’re up to cleaning your glasses, wash your hands first because they may contain oil, grime, dirt that can be transferred to the lenses. ● Using glass cleaners and saliva as a liquid when wiping your glasses. Aside, from ruining the coatings of your lens, it can cause bacterial irritation to your eyes accumulated on the frames and lenses. ● Not using a microfiber cloth to wipe off your lenses. When you use tissue paper or paper towels, or even your garments, the tiny particles found in them can scratch the lenses of your glasses. Use both hands when removing your glasses. This tip can save you from uneven wear. Pull your glasses straight off your face while gripping its side arms. It will help in keeping your glasses properly fitted long term. Moreover, when you remove your glasses with one hand only, you may end up misaligning or loosening its earpieces. As a result, you'll end up having frames that fit your face incorrectly. Glasses come with a protective case which protects the glasses from accidental harm or damage. It also provides a convenient place after using your lenses. On the other hand, when you just lay them down after using, you might accidentally press or even sit on them. So instead of putting glasses anywhere after removing them, place them in their protective case. Moreover, if you use their case, be sure to put your glasses lens-side up to avoid scratches. If you have a car, never leave your glasses in it especially during the hot days. Since most lenses are made out of liquefied plastic, it tends to become too flexible. Or worse, it can melt especially for plastic frames. Aside from lenses of your glasses, its frames are vital, too. To keep the frames of your glasses in its original form and size, avoid putting your glasses on your head. Moreover, if you do this to your glasses, you’re staining its lenses. The hair contains natural oils which cause the lenses to be stained when in contact. To avoid this, always put your glasses in its protective case. Wearing your glasses on the beach may be a necessity to appear cool or to see the beauty of the beach clearly. But with unavoidable circumstances. Your glasses will be stained with sand. When it happens, never be tempted to use the beach water to remove the sand. If you do this, you risk destroying your glasses' joints as salt in the beach water speeds up corrosion. Moreover, it will also damage your lenses as the salt crystals can scratch your lenses. Instead, use mineral water at hand or wipe it with a microfiber cloth. No matter how close you are to a person, never let them wear or try on your glasses. Remember that when you bought them, it was hard to find the right fit. Therefore, when you let other people wear them, you risk your frames to be stretched. It happens especially when their face or head size is broader than yours. If unavoidable, just let them check it while holding it but never allow them to wear it. Extending the life of your glasses is simple. When you follow these tips, you can avoid having to buy another pair. 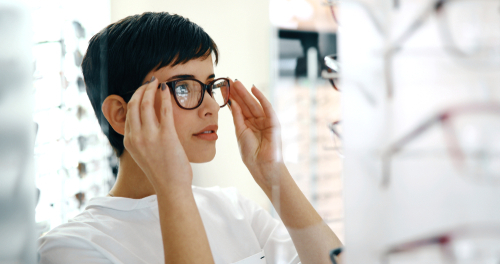 Aside from saving money from its proper maintenance, you’ll avoid the tedious process just to have well-fit glasses. Moreover, when you have well-maintained glasses, you’ll have a clearer sight.